Weaner Meal 12% without Bovatec is designed to be offered to calves once put to pasture. Note: Palm Kernel meal is not used in our formulations. Scroll down for further product information. Categories: CALF, FEED GRAINS, Mixed, ON FARM. Introduce Happy Calf 20% as early as possible, offering as much as can be consumed within 24 hours, discard any stale uneaten feed. Weaning from milk can take place when calves are consuming at least 1-1.5kg of meal per day over three consecutive days. It is recommended that Weaner Meal 12% is offered to calves once put to pasture at a rate of approximately 1.5kg reducing to 0.5kg per day at 12 weeks. It has been shown that milk bypasses a calf’s rumen therefore development of the rumen is slow so it must be fed a starter meal separately from the milk to go to the rumen. Feeding a calf starter meal is to develop a calf’s rumen or more specifically the papillae (finger-like projections on the surface of the rumen) that absorb nutrients from the rumen contents. The earlier and quicker the rumen papillae develop, the more nutrients can be absorbed, the faster the calf grows, and the sooner it can be weaned. 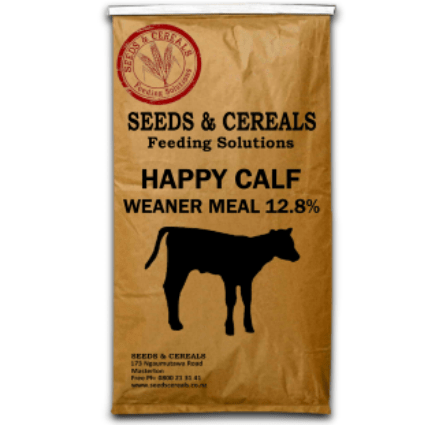 It is recommended that a weaner meal is offered to calves once put to pasture this will maintain growth rates and provide continued protection against coccidiosis. Microbes breakdown concentrates in the rumen and research has shown that the fatty acid butyrate made by the microbes from the breakdown of a starter meal that contains a concentrate like grain is the most potent stimulator of rumen papillae development. A quality source of fiber like hay or straw is important for quick rumen development because it will prevent parakeratosis. Parakeratosis is a buildup of excessive karatin (fibourous protein) on the surface of the papillae which effectively covers the absorptive sites and reduces their ability to absorb nutrients. The physical abrasion of the fiber will prevent the buildup of karatin on the papillae. Access to plenty of fresh water is essential for rumen development, remember milk bypasses the rumen and so does any potential moisture, if a calf is receiving starter meal which is heading for the rumen then it is essential that it is accompanied by moisture for proper function. Bovatec is a feed additive that controls coccidiosis this is a parasitic disease usually affecting young calves aged 3-8 months and in some cases as early as 4 weeks of age. The disease causes calves to become sick, some may die and surviving animals can have long term intestine problems causing ill thrift and poor growth.